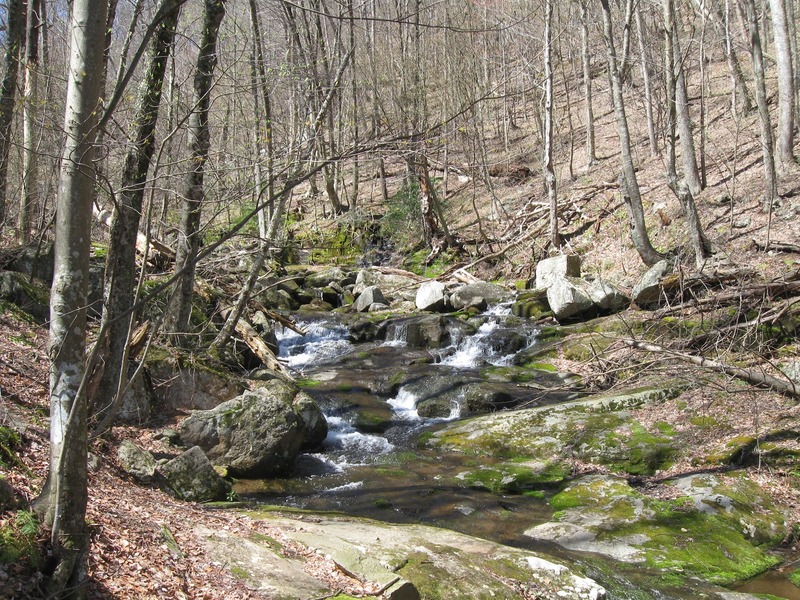 The Flying McLeods project for today was maintenance of waterbars on the Appalachian Trail south of Frazier Discovery Trail. Waking up to rain, I looked for a cancellation notice, but seeing none, I headed off in the drizzle, then fog on reaching Skyline Drive. At Loft Mountain Wayside, I found the other crew members, and noticed that the ranger station and restrooms building had gone. I headed south through the fog, with little traffic. 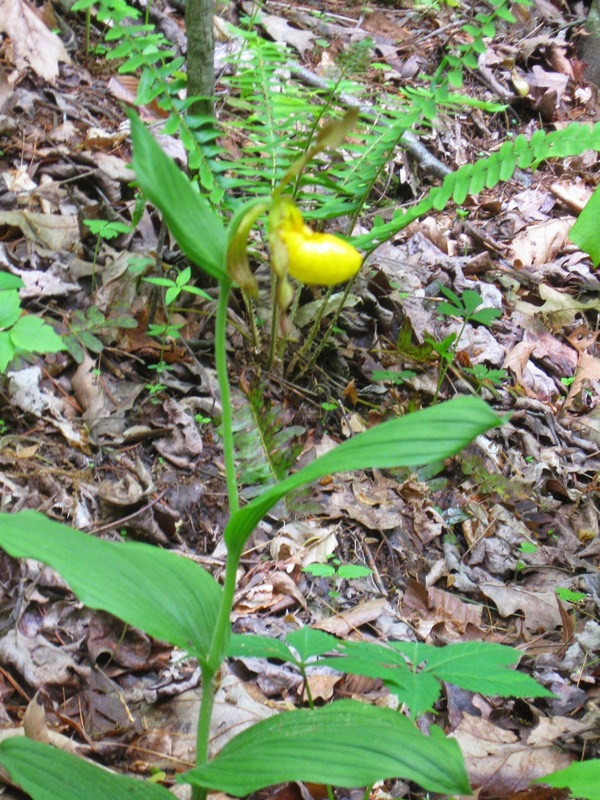 At McCormick Gap, I cut some shrubs bent over the trail in part because of rain, and also removed more garlic mustard, which had either flowered or come out of hiding since the previous trip, and noted that multiflora rose is expanding. Then it was home to start cleaning wet, muddy tools and clothes. 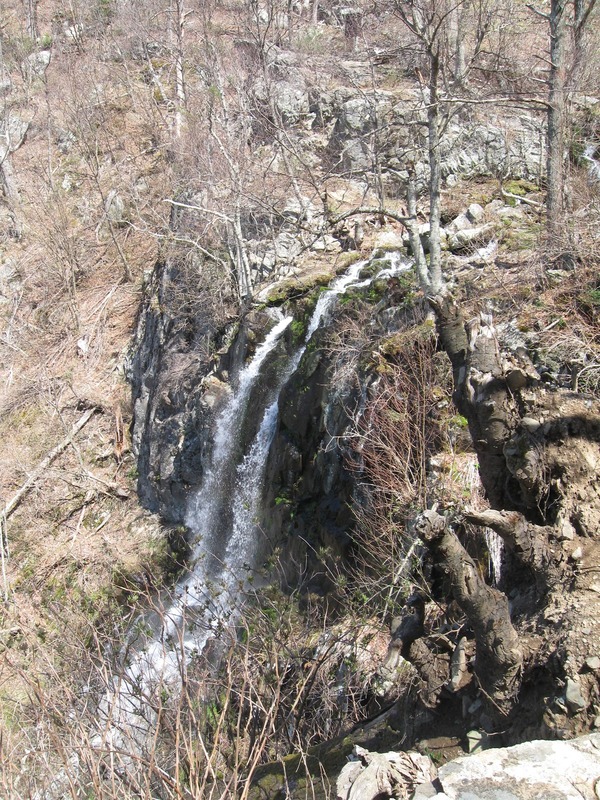 This hike was advertised as a magical hike at the peak of wildflower season in a woodland hollow with a ﻿﻿gorgeous flowing stream—an accurate des﻿﻿cription, and in terms of natural beauty, magical it was. Iva Gillet led the hike assisted by Dan Ralston as co-lead on his first leader-in-training hike. The location for today’s adventure was west of Amherst and past the Forks of Buffalo (how’s that for an intriguing name? ), starting at Long Mountain Wayside. The hiking route went like this: south along the Appalachian Trail (AT) from the Wayside, descending about 700' along Brown Mountain Creek, passing the Brown Mountain Creek AT Shelter (lunch stop), traversing two creek crossings on footbridges to the intersection of the AT and Forest Road 38, returning to the Wayside along the forest road. 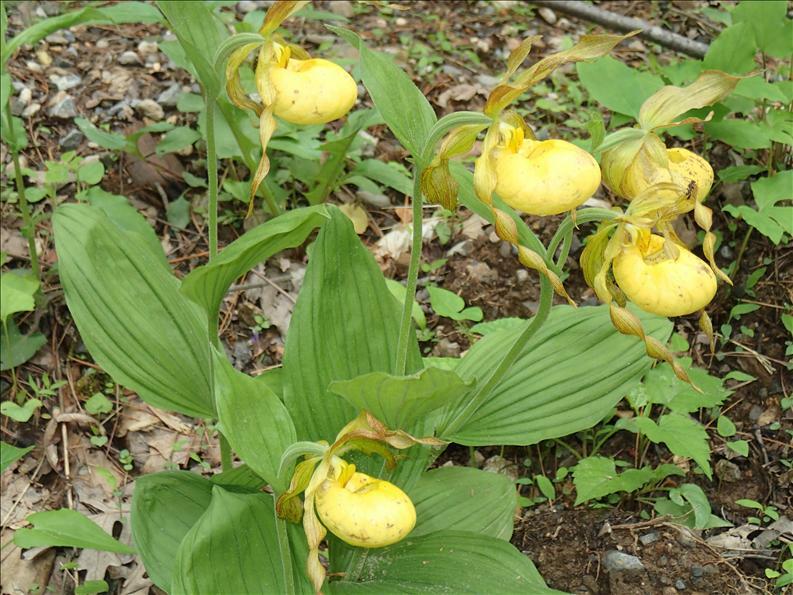 Wildflower enthusiasts, a phrase that describes all the women in the group, hit the jackpot on this hike. Iva spotted a lovely showy orchis early on, and soon we were seeing lots of them. Wild azalea, wild geraniums, squawroot, lush ferns, and lots of flowers that we admired but did not identify (Michael Seth, where are you?) grew in the area. 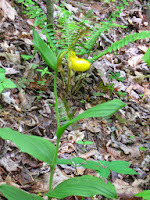 The most exciting flower-find of the day: the rare yellow lady’s ﻿﻿slipper. 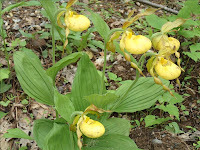 Shortly before reaching the forest road in the afternoon, Marian Styles and Barbara Martin saw two of them growing right beside the trail, and we spotted a handful more on the opposite side of the trail. The faster hikers didn’t completely miss out because we later saw a few more of the spectacular flowers off the road and beside the stream. 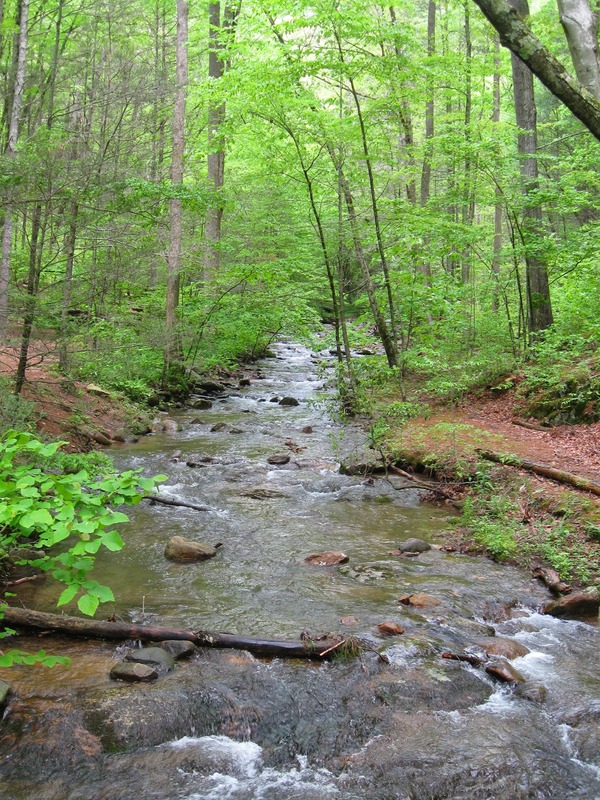 As if the wildflower bonanza weren’t enough, history buffs were rewarded with seeing a site along Brown Mountain Creek of an old settlement where freed slaves once lived. In the wildlife department, we admired several Red Efts, which were really more orange with colorful spots on their backs. Bill Holman rescued one from the forest road. But let’s not forget about the most important part of the hike: lunch! ﻿﻿﻿﻿ While having lunch at the Brown Mountain Creek AT Shelter, we were joined by a through hiker who started in February from Springer Mountain. 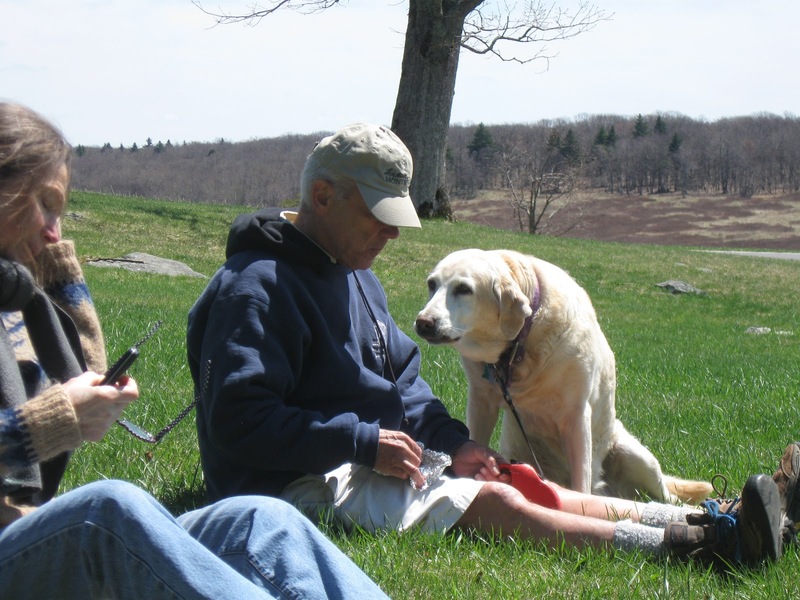 He was hiking with his girlfriend, who joined him for a section of the VA AT. She was having tuna for lunch, which Iva proclaimed as “cat food.” We also passed several through hikers on the trail heading north to Katahdin in Maine. In the trail maintenance department, some of us cleared a couple of blowdowns along the route, with bare hands, no less. Just as Dan had predicted before the hike, the forecast rain never came. We capped off a lovely day with a stop for ice cream, and some folks continued the good times at the Timberwood Grill. In addition to those already named, also hiking were John Shannon, John Brandt, Rich Bard, Page Williams (Iva's cousin), Brian Muszynski, and Ken Moss. We covered 7.4 to 8.4 miles, depending on whose GPS we used (Bill’s, Dan's, Ken's or John Shannon's)—although Ken's and John's did match to around 8 miles because they were using the same model. 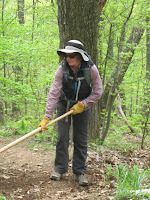 After snow falls of winter, spring finally arrived, making it time for spring cleaning on the Appalachian Trail. Marian Styles and John Shannon left their own weeds and fur balls to make the chapter’s section of Appalachian Trail ready for the season. With a small crew, we made the priorities the ends of the section, which have the most water control structures. Because of some earlier cleaning, and good design, there was not a lot of cleaning, but as usual, a little tweeking to try to improve water diversion efficiency. To prevent, or slow, the trail becoming a wasteland of weeds, we also removed garlic mustard, which was less plentiful than expected, a sign of hope that previous efforts had an effect. However multiflora rose is growing prolifically at McCormick Gap, and we cut back some. Near Rockfish Gap, we continued to thin out a large patch of bittersweet which was discovered after it contributed to the fall of a tree in last year’s derecho. Several backpackers thanked us for our efforts. 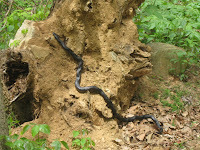 Another sight was a large black snake on the side of a trail. After several minutes, it started into a hole in a stump, and half an hour later, it had disappeared after its sun bath. On April 27, one of several PATC activities was the South District Trails Workshop, being offered after a break of a couple of years. This year the workshop was at Schairer Trail Center. The event attracted some familiar faces, including cabin people Mary and Thomas Jorgensen, who were there to cook and do some cabin work. The three official presenters were District Managers Don White and Mark Gatewood as well as new District Manager for blue-blazed trails, retired SNP ranger Steve Bair. Five people from the Appalachian Trail relocation project at Little Calf Mountain attended, and three others. Three members of Charlottesville Chapter attended (Andy Willgruber, Briana Taylor, and I). The program featured talks on the history of trails in SNP, how to avoid injuries, and how to clear vegetation. I gave a talk on invasive plants—a talk that I didn’t know ahead of time I was slated to give. 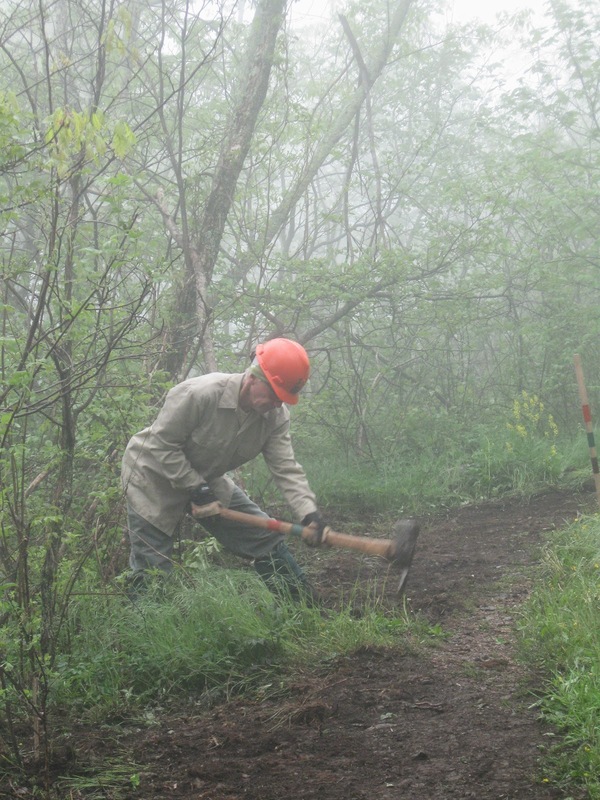 The workshop included practice doing vegetation clearing. We also built a log waterbar, did some trail regrading and widening, and cut a log with a pruning saw and a two-person cross-cut saw. Following talks on blazing and filing work-trip reports, several people said that they needed to leave, despite the tempting fragrance of dinner being cooked. One tangible benefit of the workshop was that at least two attendees signed up to be trail overseers. And a participant who has considerable trail experience said that the workshop had taught him how a waterbar should be laid out. For some of us, the most useful part of the day was making or renewing contacts with other trail people. Ken Moss chose this hike near Big Meadows, which he introduced to the group a couple of years ago, to offer something for nearly everyone-waterfalls, short hike, coffee and burgers for lunch, a full day of hiking for others. This attracted a couple of relatively new people, and two of our group who have been unable to join us for a while. 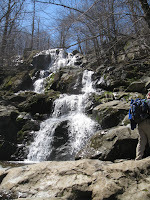 We started the cool day at Fishers Gap, heading down Rose River trail, past the first of the falls. Only one person expressed interest in visiting the old mine shafts in the area. 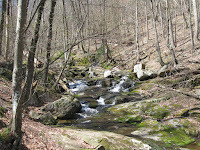 After a side trip to Dark Hollow Falls, we returned to Fishers Gap along a fire road. Some people headed home while others departed after lunch at Big Meadows. The last five headed to Lewis Falls and a short circuit back to Big Meadows.